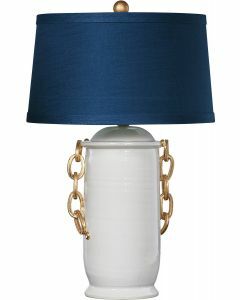 This lamp couldn't be "hauter" with chunky gold chain link handles on a white base. The base was hand thrown on a potter's wheel in Tuscany. 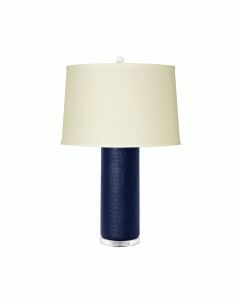 The lamp is topped off with a drum hardback shade in black shantung silk with self trim banding. The lamp measures 30"H and the shade measures 16" in diameter on the top, 18" in diameter on the bottom and 12" on the side. Lamp also features a 3-way bulb function. Click on image for greater detail.